In his highly anticipated autobiography, Who I Am, rock icon Pete Townshend shares the story of his evolution from angry young Mod to one of the defining musicians of his generation. 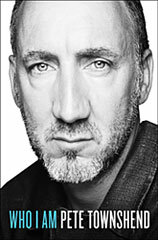 The songwriting genius behind the music of The Who, as well as the group's aggressively talented guitarist, Townshend has long been the thinking man's rock star, and this introspective and candid memoir charts the musical, intellectual, and spiritual journey that has shaped his life and career. Townshend writes frankly of his constant search for meaning, while sharing stories from the wild heyday of The Who and beyond. Please join us as we welcome Townsend to the Clive Davis Theater, where he will be signing copies of his new memoir.